Donald Trump ordered a military strike on a Syrian air base. Seoul: The US missile strike on Syria contained a clear message for North Korea and its main ally China, analysts said, but not one strong enough to push Pyongyang off its nuclear weapons path. While the timing was largely coincidental, the fact that US President Donald Trump ordered the strike while hosting a summit with Chinese leader Xi Jinping carried particular resonance given that the North's nuclear ambitions -- and how best to thwart them -- was among the top agenda items of their meeting. And exercising the military option added some extra weight to Trump's recent threat of unilateral action against Pyongyang if Beijing fails to help curb its neighbour's nuclear weapons programme. Kim Yong-Hyun, a professor at Dongguk University, said the strike against Syria was a statement of intent that was meant for a wide readership. "It signals to Pyongyang that the US has a new sheriff in town who isn't hesitant about pulling his gun from the holster," Kim said. But while the move might have given the North pause, Pyongyang on Saturday said the strikes only confirmed its view that nuclear weapons were key to guaranteeing its future survival. "The reality of today shows that we must stand against power with power and it proves a million times over that our decision to strengthen our nuclear deterrence has been the right choice," state media reported an unnamed foreign ministry spokesman as saying. The Syria strikes were an "intolerable act of aggression," he added. The North has carried out five nuclear tests -- two of them last year -- and expert satellite imagery analysis suggests it could well be preparing for a sixth. US intelligence officials say Pyongyang could be less than two years away from developing a nuclear warhead that could reach the continental United States. If Thursday's strike was a warning to other countries, it was one with which Pyongyang, which regularly cites US hostility as the driving force behind its nuclear weapons development, is quite familiar. 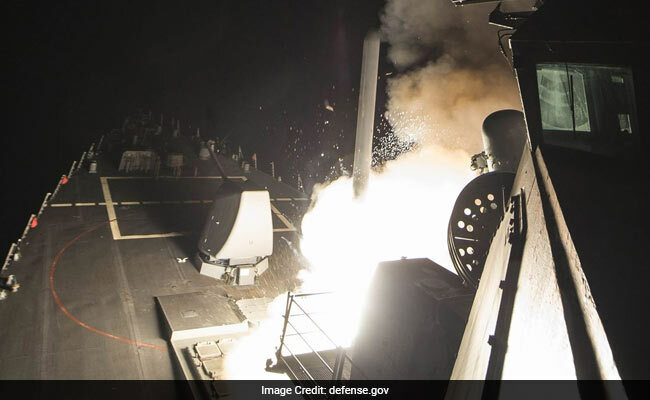 "Trump's attack on Syria is unlikely to have any significant effect on a North Korea that is already well versed in the threat posed by the United States," said Joel Wit, a senior fellow at the US-Korea Institute at Johns Hopkins University. At the time of the US-led invasion of Iraq in 2003, then North Korean leader Kim Jong-Il disappeared from public view for around six weeks -- and was widely believed to have gone into hiding for fear of a US attack. Chang Yong-Seok, a senior researcher at the Institute for Peace and Unification at Seoul National University, said Kim's son, current leader Kim Jong-Un, had no reason to take such precautions. "Armed with nuclear weapons, he would hardly flinch at the attack in Syria," Chang said. As if to underline the point, North Korean state media released photos of a smiling Kim inspecting a mushroom farm. The question then arises as to what impact the US president's willingness to exercise his military muscle may have on China's thinking. China is North Korea's economic lifeline and as such enjoys more leverage over its maverick neighbour than any other country. Like his predecessors in the White House, Trump wants China to do more to influence the North's behaviour, but has gone further than others in threatening to go it alone if Beijing fails to step up to the plate. In that context, the strike against Syria may resonate more firmly in Beijing than Pyongyang. "It's a signal that Trump's administration will not only talk, they will act," said Wang Dong, Associate Professor and Director of the School of International Studies at Peking University. While China has clearly lost patience with Pyongyang's nuclear provocations, it is extremely wary of any response that might bring about North Korea's collapse and chaos on its doorstep. "From the Chinese point of view, there is still room to explore a path for a diplomatic solution," Wang said. Jia Qingguo, a professor of International Relations at Beijing University, said the North's nuclear arsenal and highly sensitive geopolitical position meant the fallout of any military action could be catastrophic. "A small kick could provoke big disasters. It's not like Iraq," Jia said. Although China's state media went strong on photos and coverage of the Xi-Trump summit, it gave little space to news of the strikes against Syria, with few editorials or commentaries. One exception was the nationalist-leaning Global Times, which suggested that Trump's "show of force" was rash and ill-considered. "This was Trump's first major move in international affairs, and it leaves an impression that the decision was made in haste and not without contradiction," the newspaper said.